It's 7 PM in an upscale hotel conference room in San Francisco, CA and seven members of one of the US' most beloved K-Pop groups, Monsta X, are sitting on the opposite side of a large wooden table in cool, black, military-themed clothing. 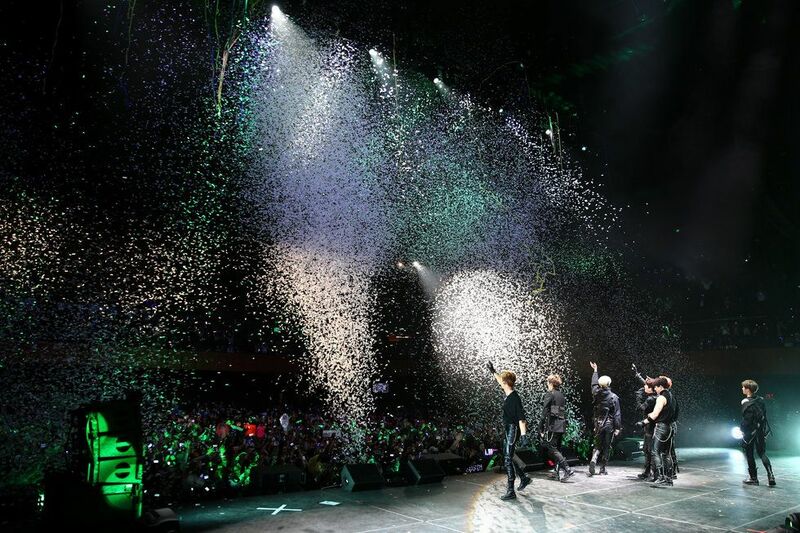 Tonight, the group will continue to make history for the second night in a row as the first K-Pop group to ever perform on KIIS FM's Jingle Ball Tour. For now, however, they're just seven rambunctious boys, each with their own distinct personality and role within Monsta X that keeps the group going strong. At 22, I.M is a rapper, the youngest member of Monsta X, and definitely the most mischievous; he cracks jokes and teases his older members throughout our conversation. He's also the only member of the group who speaks English fluently, having lived in Boston for three years. But that doesn't mean he's the only one answering questions; singer and "vitamin" of the group Minhyuk quickly demolishes any language barrier by answering every question he can, at times leaning toward I.M for a quick translation if he's unsure of a particular word before repeating it back with a smile. Vocalist Hyungwon is the group's quietest member and sits directly across from me tucked into a black jacket to battle San Francisco's chill, all sleepy eyes from an early morning of travel from Los Angeles. Next to him is singer Wonho, who throughout the night I discover has two sides to him; the one sitting across from me is bashful, all smiles as he allows the other members to talk. 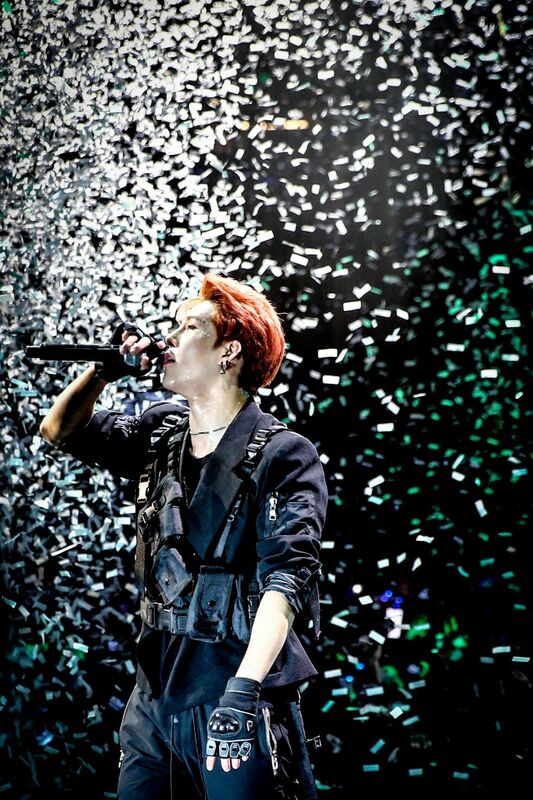 His second side appears later, after Monsta X's set is over, when he takes the stage once again to wave goodbye to their fans (called Monbebe), before he pulls off his black vest and tosses it into the crowd for a lucky fan to take home. The group's leader Shownu makes a strong effort to speak in English, but slips back into Korean to express his more heartfelt comments when speaking about Monsta X's fans and future. Rapper Jooheon stands out the most with his fiery red hair, and he answers questions in English with such confidence you'd assume he was fluent too. At the farthest end of the table sits singer Kihyun, who at one point can be found on his phone, but not due to boredom; he makes a comment about wanting to try clam chowder, and I realize that he's been subtly researching information about San Francisco the entire time. Monsta X has been together for more than three years since their debut on May 14, 2015 with the bold hip-hop tune "Trespass," and are capping off an incredibly busy year full of touring and multiple album releases with one more historic tour of America as headliners of the Jingle Ball Tour, performing alongside artists like The Chainsmokers, Halsey, and Shawn Mendes. "Excitement" and "proud" are the first words that come to their minds. "This tour is so meaningful to us because we are the first K-pop group [to perform]," says Kihyun. "Since it's a stage that we have waited and prepared a lot for, we will try our best to show the audience our best performance." Minhyuk answers, "After watching the concert yesterday, [performing at Jingle Ball] feels and sounds different compared to watching it on YouTube." And I.M adds, "It was like a dream. It was unbelievable." It's a thought that must loom over I.M's head, because he makes a point to address it in the group's introduction during their performance that night: "Just in case you don't know about us, we are from Seoul, South Korea and we are a K-pop group. I know you guys feel a little bit awkward about K-Pop, but if you [are having] fun, just feel it tonight. Whatever you guys think about K-pop, we're going to break the form." He doesn't need to worry; the group's fans have been waiting all night pressed against the barricade to see Monsta X perform. During their set, Monbebe wave lightsticks, sing along to fan chants, and wave light up signs depicting the name of their favorite member. Though their set contains only three songs, "Fallin'" (Kihyun's favorite), "DRAMARAMA" (Wonho's favorite), and their latest single "Shoot Out" (I.M's favorite), for 15 minutes the entire auditorium is transformed into their private concert. "Shoot Out" is the group's comeback track from their new album, Take.1 Are You There? "The beat is very insane and intense, but the lyrics are beautiful. The song has a painful story," explains I.M. "Shoot Out" is what the group calls "Monsta X-style music," because of its bold melody and strong hook. The track's lyrics describe "searching for a savior" to rescue the members from their feelings of loneliness amongst the lost and stray souls of the world. On November 9, Monsta X released an all-English version of "Shoot Out," which premiered on Los Angeles' 102.7 KIIS FM. The English version of the track was primarily created "to express our thankfulness toward our international fans," according to the members. "When we go on our tours, we find that a lot of foreign fans sing along with our songs in Korean. Every time, we were extremely impressed and wanted to return the love to our foreign fans." But it wasn't all easy. "During the recording, there were difficult things to pronounce in English," confesses Shownu. "But thinking of our English-speaking fans while recording, I did it. When I finished the recording and I listened to the track it was good." Jooheon comments, "In the Korean version, ['Shoot Out'] was recorded like a K-Pop song, but in the English version it was like we were singing a pop song, which was fun." Jooheon is one of five members to receive songwriting credits on Take.1 Are You There? The group has been very involved in the album-making process since their debut, with I.M and Jooheon writing the raps to all of their songs. Since then, all of the members have branched off, dabbling in songwriting, musical production, and arrangement. Shownu recently collabed with British band PREP on their single "Don't Look Back," and Hyungwon began DJing under the name H.One. He mentions Calvin Harris as a dream collaborator, saying: "I saw his performance yesterday but didn't meet him." On the new record, Wonho wrote, composed and arranged the track "I Do Love U," and Minhyuk and Kihyun earned their first writing credits on the track too. Everything is I.M's songwriting inspiration: "I get my inspiration from very simple things," he says. "It can be my imagination, what I see right now, what I want to see, or what I dream usually. Simply, anything can be everything, so inspiration comes very easily to me." Minhyuk finds inspiration in Wonho: "Wonho's lyrics are really something beautiful and pure," he says. "So I get inspiration from Wonho." (A blushing Wonho thanks him). And Jooheon is inspired by those closest to him. "My fans, my members, my parents," he says. "Everything is my inspiration." Following the festive spirit of Jingle Ball, when asked what kind of gift the members would want to give Monbebe for the holidays, a variety of answers pop up that range from dressing up as Santas to holding a Christmas concert. Shownu wants to gift fans special choreography he's created. Minhyuk's answer is an expensive watch, but with the hands stopped at 5:14, a reference to their debut date. I.M's gift is a bit more cheeky. "Tony Moly?" He ponders, referencing the Korean beauty brand Monsta X modeled for in October. The other members burst into laughter. With the holidays still far away, the group has some words of affection for Monbebe too. "Please don't catch a cold!" Wonho yells. Kihyun answers, "Like Wonho said, the weather is getting more and more cold. We promise to see you again soon." Shownu quips, "This year, everyone did a good job and I look forward to seeing them next year." And Jooheon replies, "Because of Monbebe, we were able to receive a lot of great awards and great gifts, so I hope to next year return the favor and give Monbebe gifts too." Though 2018 is ending on a high note for Monsta X, the group still have their eyes set on the future. They just announced a third official fan concert on January 5, but also interested in this time next year too. "Because Jingle Ball is an annual event, I would like the opportunity to perform again," Jooheon says slyly. The rest of the group quickly agrees. Stream Take.1 Are You There? by Monsta X, below.